Tera Colson is guarded by Graves County’s Bailey Wilson, in the second quarter of the Lady Marshals home game against Graves County Friday. 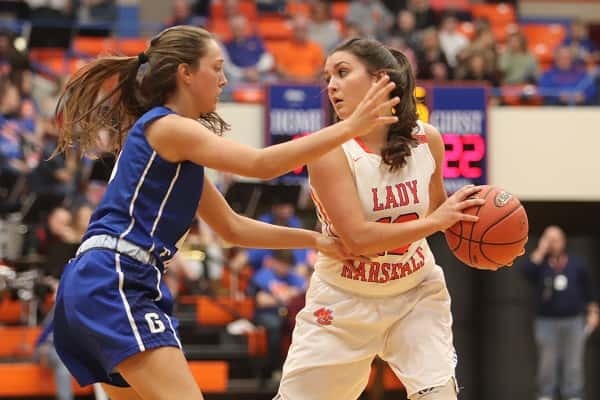 Graves County’s last loss came at the hands of the Lady Marshals on their home court Jan. 11. They have won five straight since that loss coming into Draffenville Friday evening and were looking to even the score. Lorin Powell scored 10 points for the Lady Marshals in Friday’s Homecoming game against Graves County. Tied 13-13 at the end of the first quarter, Sophie Galloway put the Lady Eagles up by two to start the second quarter, tied on a basket by Lorin Powell before Graves County scored the next seven points from Galloway, Raychel Mathis and a three by Taylor Carrico to lead 22-15 before the 7-0 run ended on a basket by Powell and they trailed by six points at halftime. Halle Langhi cut the Lady Eagles lead to four points to open the second half but it was followed by another 8-0 run by the Lady Eagles on two 3-pointers from Bailey Wilson and Carrico and a basket by Mathis. Tera Colson stopped the run with 3-pointer which was countered with a three from Mathis for a 12 point Graves County lead. Powell closed out the third quarter with a basket to cut the deficit to 10 points. 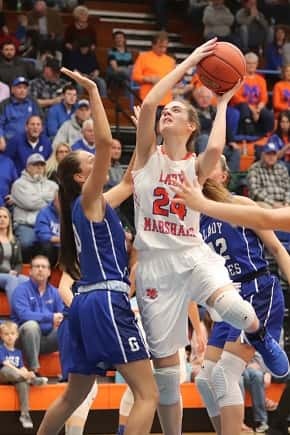 Graves County stretched their lead out to as many as 17 points in the fourth quarter, too much to overcome for the Lady Marshals who cut it to 13 points at 45-32 with a minute remaining before falling by 15 points at the final buzzer. Mathis led Graves County with 16 points, Cayson Conner led Marshall County with 13. The Lady Eagles improve to 18-6 on the season while the loss gives the Lady Marshals the same 18-6 record. They will play a district game Tuesday at Murray (19-3). Murray locked up the number one seed in the district tournament Friday with their win over Calloway County.